Throughout Tyson Fury’s embryonic boxing career he has embraced and wrestled with more media attention than his exploits in the ring have thus far merited. In part due to his eye-catching name, part due his back-story as a 6 foot 7 inch giant from travelling stock and in no small part to the potential he showed. On the surface, Fury has revelled in the attention and seemed naturally quotable whenever a camera was pushed in his face. Youthful charisma or an arrogance waiting to bite him on his not inconsiderable posterior? Depends how you like your fighters, respectful and humble or brash and loquacious? In the run up to his much required rematch with John McDermott the normally omnipresent Fury has been uncharacteristically quiet. A cause of some concern to Frank Maloney, who has to sell tickets for the clash and for fans, who want to buy them. Over the past few weeks the giant 22-year-old has left the nurture of Brian Hughes and returned to Uncle Hughie’s guidance, I’ve lost track of those he has called his trainer or in which sequence they have been in his employ, and he also failed to attend the first press conference Frank Maloney called to promote the fight – which takes place next Friday, 25th, at Brentwood Leisure Centre. The reason for his absence was limply explained by then trainer Brian Hughes who proclaimed the media event would prove too much of an intrusion or diversion from his training schedule. Now any suggestion Fury would be unwilling to nip out of training for the day to sit in front of television and press reporters strikes this observer as at least a ‘stretch’ and at worst downright misleading. 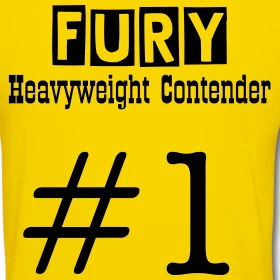 For all his natural instinct for a fight, his physical gifts of height and reach and his ability Fury has yet to enter the ring in anything approximating to tip-top shape. Against John McDermott in their first encounter Fury didn’t believe it would matter such was his public disdain for the Essex heavyweight he dubbed McDonut. John’s own well-documented expansive physique has limited his own acceptance as a television fighter. 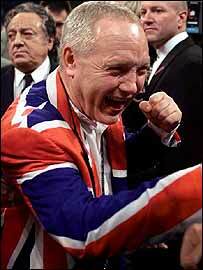 Despite that, McDermott, who turns 30 the day after the fight, proved far more resilient than Fury had expected. Fury hadn’t researched or prepared for McDermott’s gumption nor his oft-overlooked hand-speed. Fury dug in, lasted the ten round distance and left with a very charitable decision usually reserved for long-established ticket sellers who have a bad-night with an imported foe, not cherubic novices in English title bouts with fellow countryman. I contacted Frank Maloney today to enquire how confident he was that the Hennessy Sports promoted Fury would be in the ring come the 25th, as many observers continue to speculate that McDermott’s herculean efforts in training will not be rewarded with an opportunity to secure the win he so richly deserved in their first contest. Fury’s relative silence has hindered the promotion and encouraged doubt among the skeptics. Ben Carey at BoxRec News caught up with the errant English Champion earlier this week and suggested he sounded down, certainly the quotes attributed to him appeared less vibrant than previously and his suggestion he over-sparred ahead of the first McDermott fight by way of explanation for his failure to impress seemed contrived and was mooted without conviction. Read the brief interview by clicking here. Of course, Fury may yet prove to be pulling another media trick. His barbed comments toward contemporaries and opponents have always been said with a degree of humour and no small amount of tongue in cheek. His Facebook announcements of being “21stone” and having done precious little to prepare for the rematch could be designed to mislead and trick McDermott who has clearly poured himself into his own preparation with new trainer Jim McDonnell.